A few weeks ago I blogged about the seemingly insane US Naval plan to genetically engineer goats and spiders together to create a goat that gives spider silk in their milk. Such revelations mean that this book, which I would normally regard with scepticism, could also be true. I sure hope not. 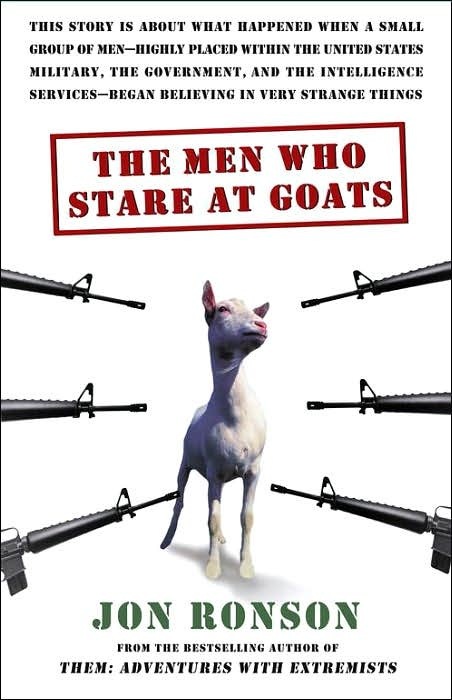 The Men Who Stare at Goats is a book about the US secret parapsychology warfare division devised in the 1970’s by New Age solider Jim Channon. Channon envisaged soldiers with extraordinary powers that would enable a new era of warfare without the death and destruction the current era has come to represent. Author Jon Ronson takes us through those early days and how they have possibly directly led to the horrors of Abu Ghraib in Iraq, the terror purposely meated out in Guantanamo Bay detention camp and the FBI led screw up at the Waco Siege. The name of the book comes from the early days. Jim Channon wrote a short 51 page manual called, “The 1st Earth Battalion” (now available online! ), that he presented to the US Special Forces at Fort Bragg in North Carolina. The SF took much of what Jim said to heart and formed a special group called the “Jedi Warriors”. These special psychic soldiers were trained by an occult martial arts master in all manner of techniques, the most famous of which was the ability to stop an opponent’s heart simply by staring at them. The Jedi Warriors trained in this technique by staring at goats. The goats in question were specially de-bleated and kept at Bragg for SF medics to test their own skills upon. They did this by shooting them in the leg, treating the wound and setting the leg in plaster. After this the Jedi’s would come in and try to stare them to death. One succeeded. Ronson’s story starts with his quest to find this mans identity and get him to demonstrate his powers. It leads into hell and back. Such Scooby-Doo style fun and games, the seemingly harmless and surreal images of plaster wearing silent goats looking worried about a soldier staring at them, are the nice part of the book. However, these New Age harmless times have led to somewhere not so funny. 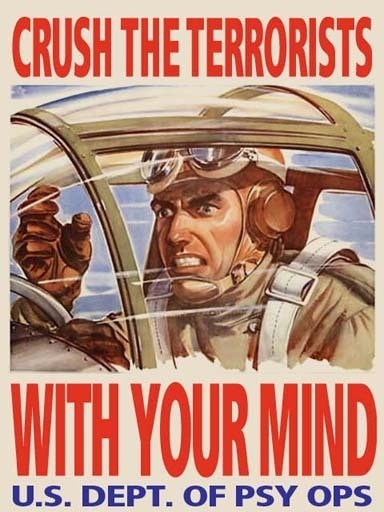 Ronson outlines through a series of interviews with those who are willing to talk that the 1st Earth Battalion thinking has led to new ways to torture people in the so-called “War on Terror”. His gonzo interview style obviously had a great effect on the Americans and he gets people to say all sorts of things. Sometime, he discovers, the parapsychology warfare group split into two: The White Ninjas, who invented such things as sticky fast drying foam and the Black Ninjas who hide subliminal messages in excruciatingly loud music played 24 hours a day in Guantanamo. Apparently, this song was played constantly at inmates. I would crack in minutes. That’s not the worst. Amongst many examples comes the story that the Abu Ghraib photos, showing Lynddie England and others abusing Iraqis, was actually a Black Ninja project to create something to scare future inmates with; to make them crack. They did this by systematically designing the most abhorrent thing possible to an Iraqi, and then setting it up. Then, when it came out in public, they simply dumped all the responsibility on Miss England and claimed it was all her idea. The book goes on interview people accusing the CIA of colluding in murders, cover ups and the Black Ninjas of having been re launched in Iraq 2008. It ends with the idea that the information out in the public domain, the funnier Goat Stuff, is actually a cover up of a different type. I listened to, rather than read, this book by downloading the unabridged version from the excellent Audible.co.uk. Much of the satirical writing is very funny, and the dead pan delivery of the narrator means all the jokes and silly images make you laugh, whereas the more horrible aspects are not glossed over. People have been responding to this book. Like many it has been optioned by Hollywood, but the latest news is that is has been taken up by George Clooney and will be staring Jeff Bridges, Ewan McGregor, Kevin Spacey and Robert Patrick. I can’t wait for that! I recommend this book to anyone who likes wild and strange stuff, anyone who likes the military or military history and anyone pissed off about the “War on Terror”. If you want to help those less fortunate, then perhaps you should donate a goat? Oxfam Goat Gift. Only £25!